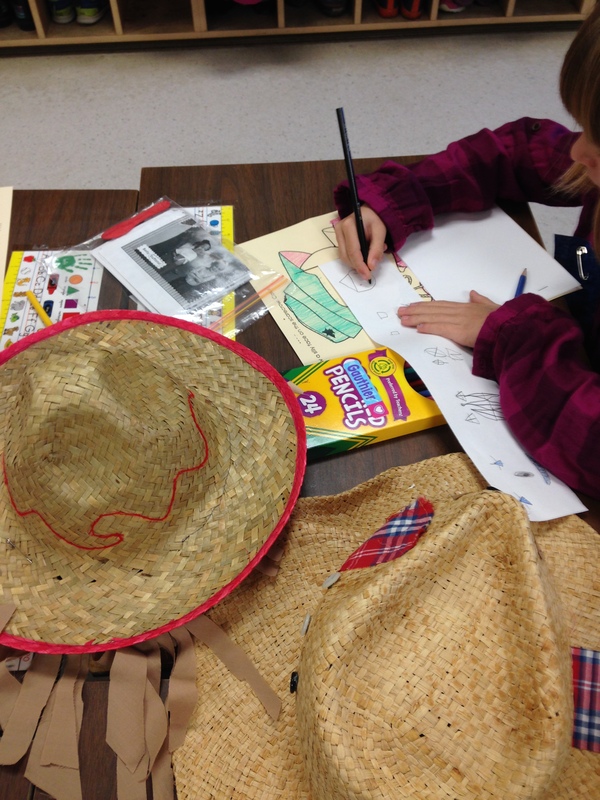 Scarecrows | Mrs. Anton's Class! We had a great time on Scarecrow Day! We read an awesome story by Margaret Wise Brown called The Little Scarecrow Boy. This story is about a little boy who wants to scare crows just like his Dad. He learns to make very scary scarecrow faces and goes out to try to scare away some crows. We made our own version of the story. 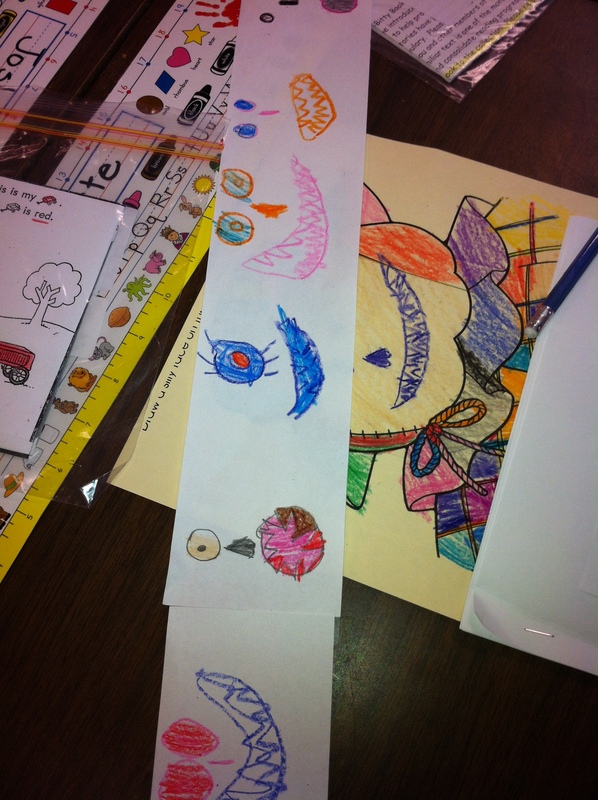 The children made six different pictures of scary scarecrow faces that they were able to slide through the scarecrow face and retell the story. I was so proud of these guys who sat down together to share their books with each other. They did a great job reading their books! There were a lot of scary scarecrow faces. 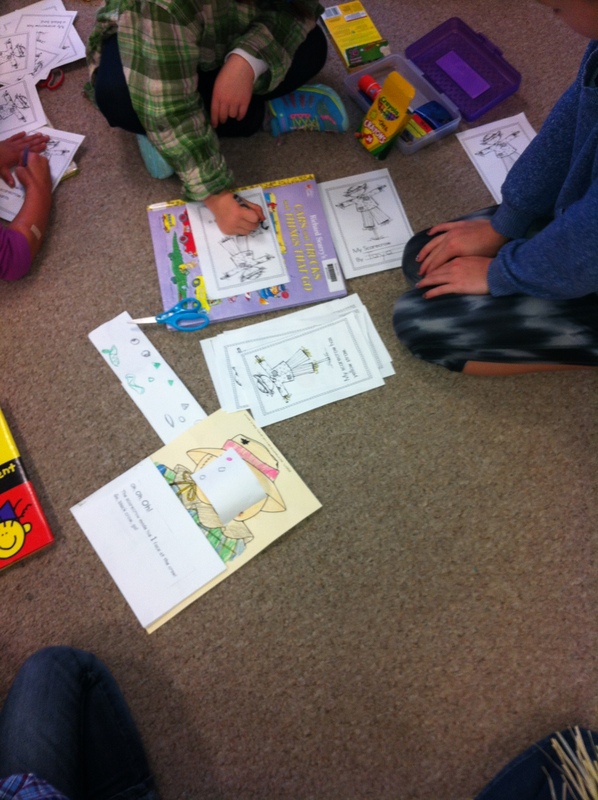 They worked very hard on their books! 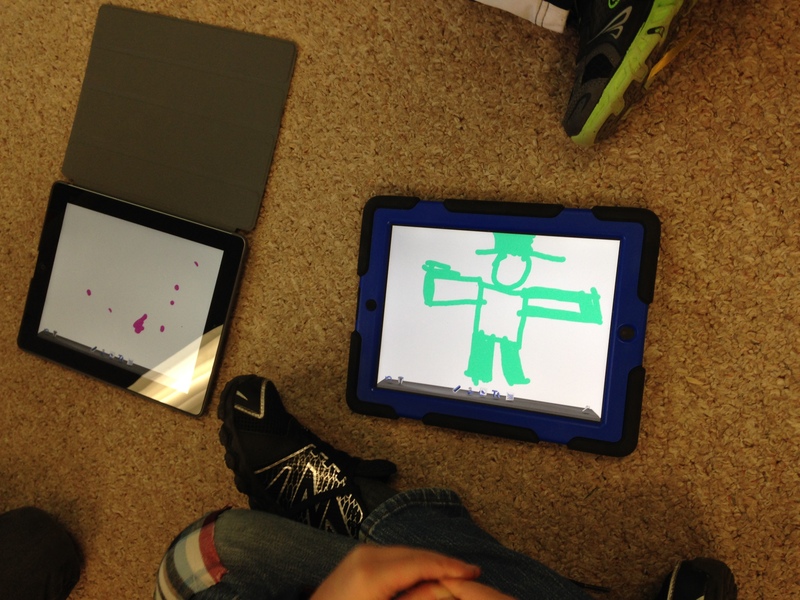 We also learned about a new app on the iPad called Doodle Buddy. This is a really superb app that we will be using a great deal! 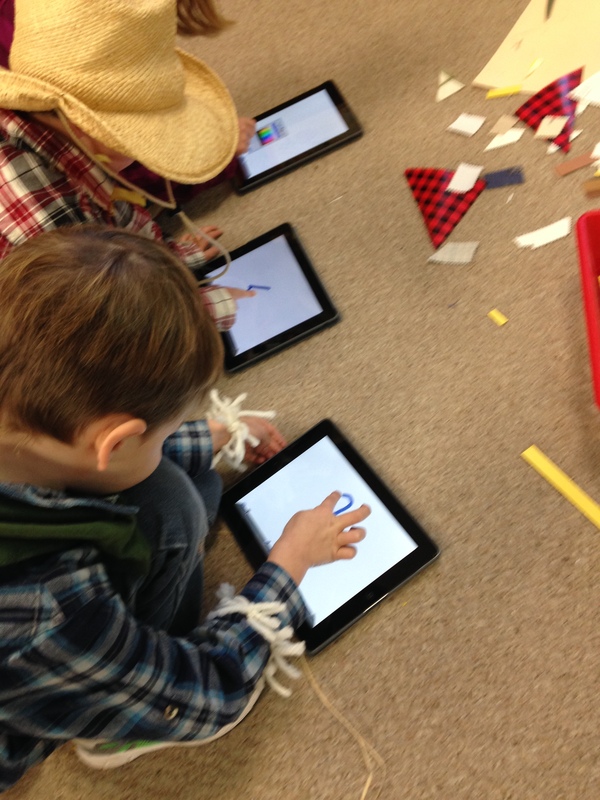 The children experimented with the drawing tools to make scarecrows. 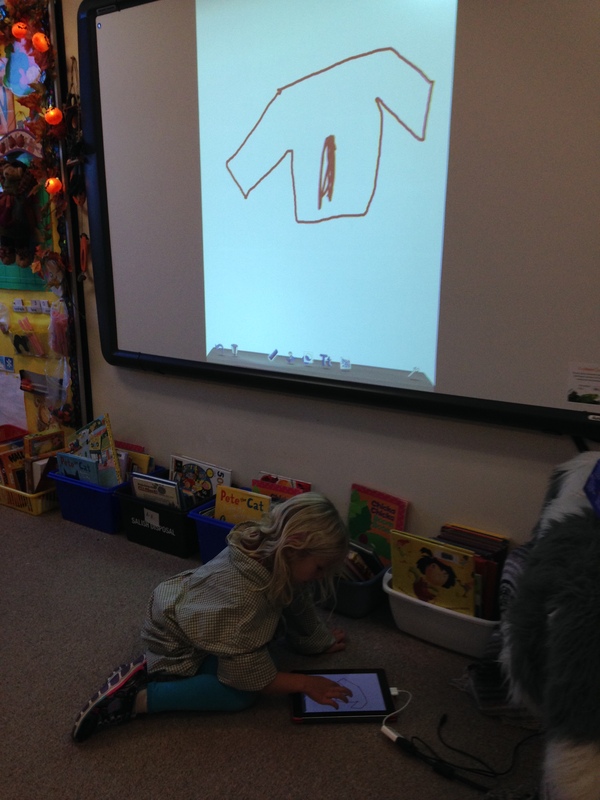 I demonstrated the app using our new Promethean Board. I can attach the iPad to the board with a special cable and the screen is projected on the board. 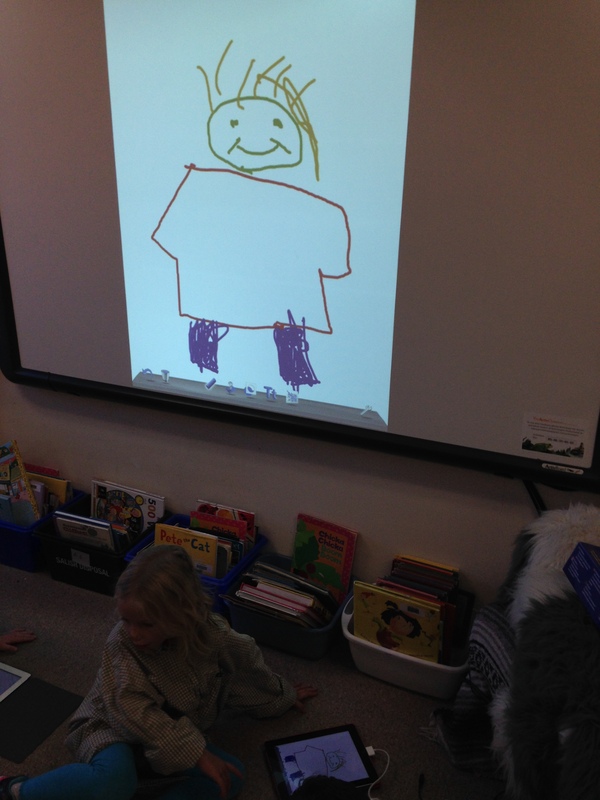 It was cute because the children didn’t initially understand that I was drawing the picture on the iPad and they thought that the board was drawing the picture! Eventually they caught on and then I had the students take over the demonstration! We also did some scarecrow cooking. We made scarecrow faces and ate them up. 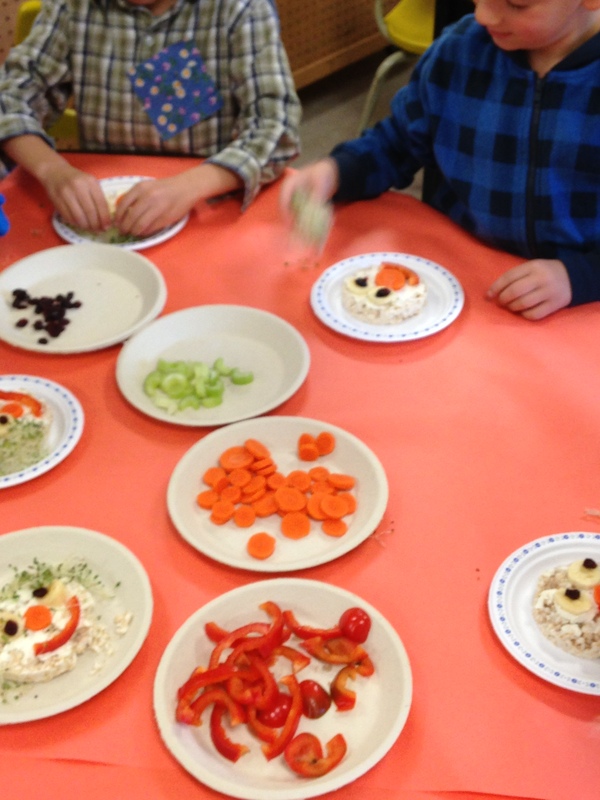 The children decorated a rice cake using cream cheese as the “glue” to put the features on the rice cake. 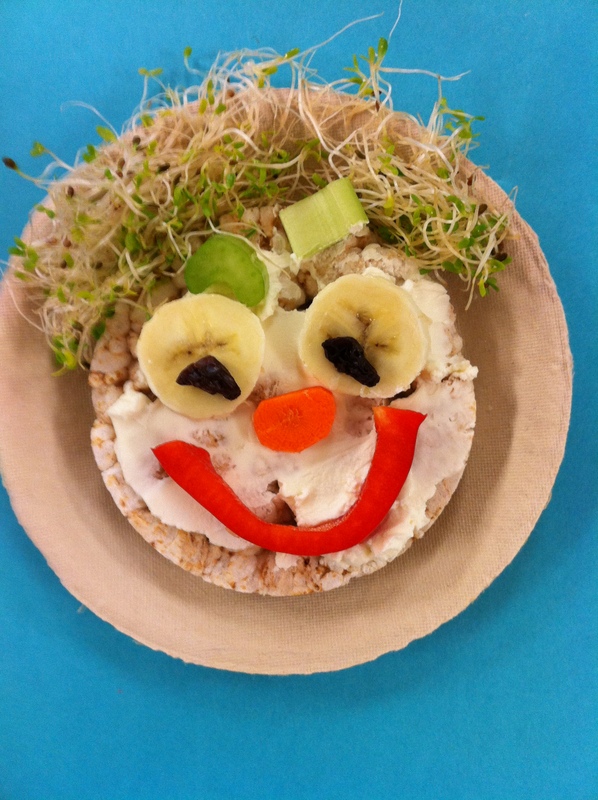 They used red pepper for the smile, a carrot for the nose, celery for the eyebrows, banana slices and craisins for the eyes, and alfalfa sprouts for the hair. Most of the children enjoyed this yummy treat or at least some parts of it! Many thanks to Carter B.’s mom for helping to supervise this activity! 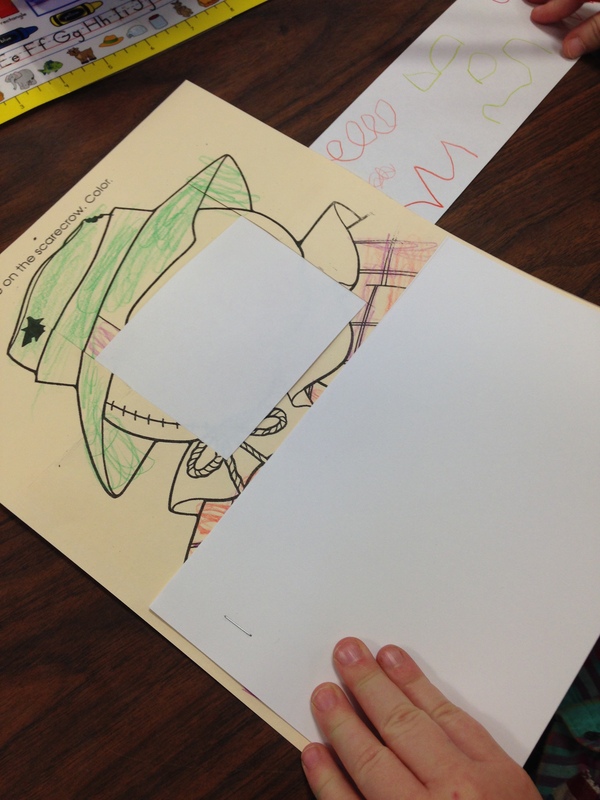 We also made another scarecrow book, made some scarecrow art, and learned to do the scarecrow dance! (the chicken dance) It was fun to dress up for the day! We took lots of pictures to share with you! Lots of fun and lots of learning too! Friday was Scarecrow Day! I loved all the costumes! Thank you so much for participating! We had some amazing scarecrows! I took pictures of the whole class and individual pictures of everyone! Good memories! 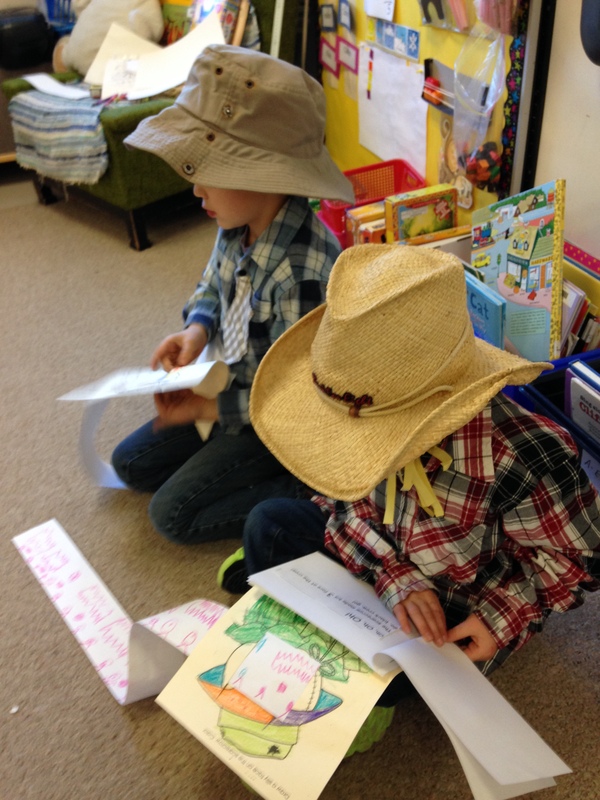 We tried to figure out how many scarecrows we had in the classroom. I like scarecrows and I have quite a collection! We actually didn’t finish counting them all as we got distracted when we realized that we had even more scarecrows because we were all dressed up as scarecrows. I hope to do the search for my scarecrows next week instead! We read one of my favourite stories by Margaret Wise Brown called The Scarecrow Boy. In the story the little boy scarecrow wants to be a real scarecrow like his Dad. One day he decides to run away and try to scare the crows in the cornfield all by himself. He makes six different faces at the crow to try to scare it away! As we read the story the children showed me their six scariest faces too! Pretty scary! 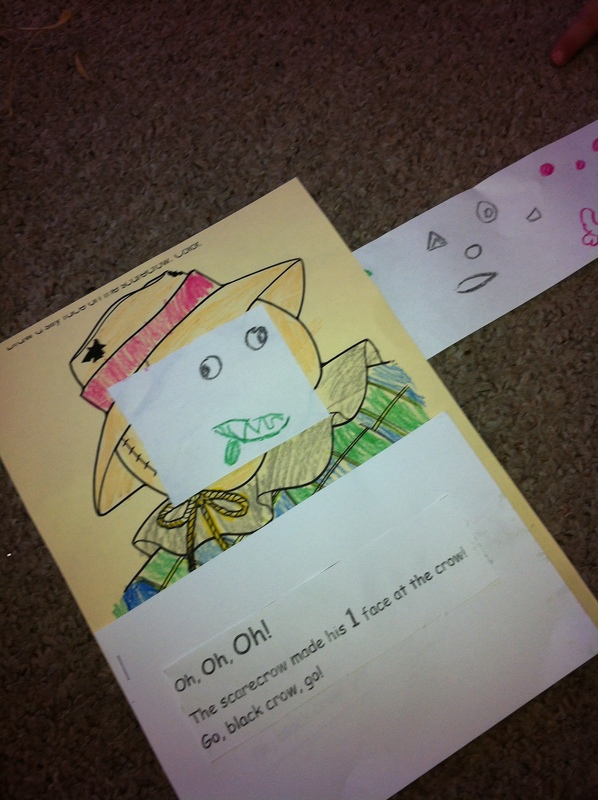 Then they made their own scarecrow faces to go with the story. Take a look! We also make these delicious scarecrow faces. Most of the students liked all or at least part of the dish! Delicious! 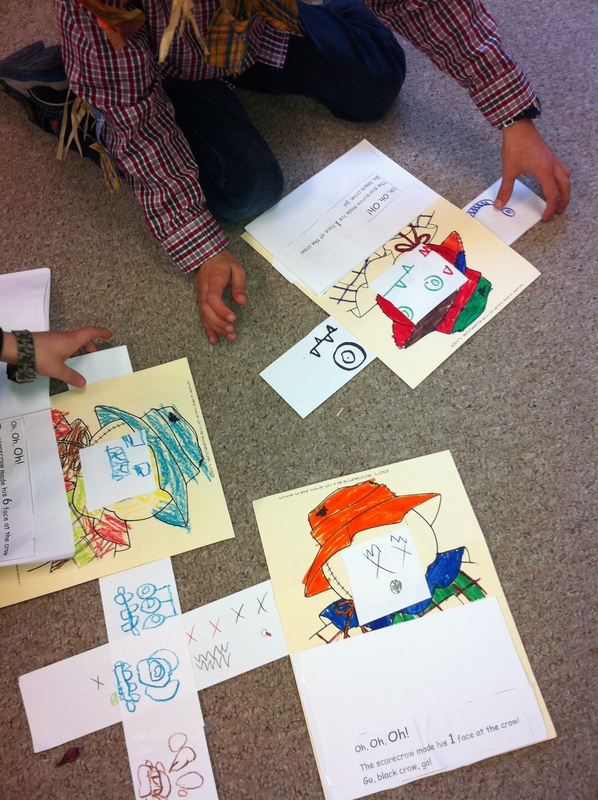 We also made scarecrow books with our buddies. They helped us cut and color them and put them together. The big buddies helped the little buddies practice reading them, too! 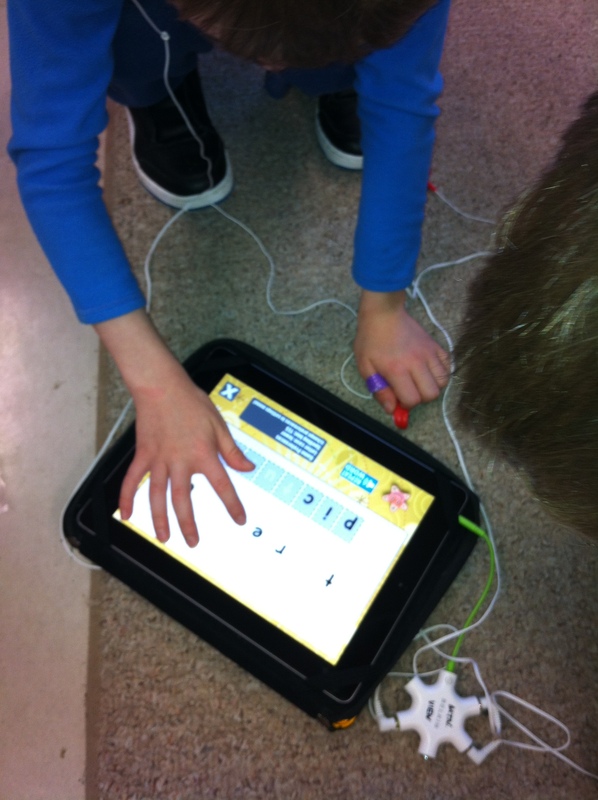 I introduced an new app on the iPads to the children that focuses on learning the beginning sight words we are currently learning. It is called Word Bingo. You can find it on the ABC Ya! website as well. I like the version for the iPad! We are currently working on the PrePrimer Dolch word list. 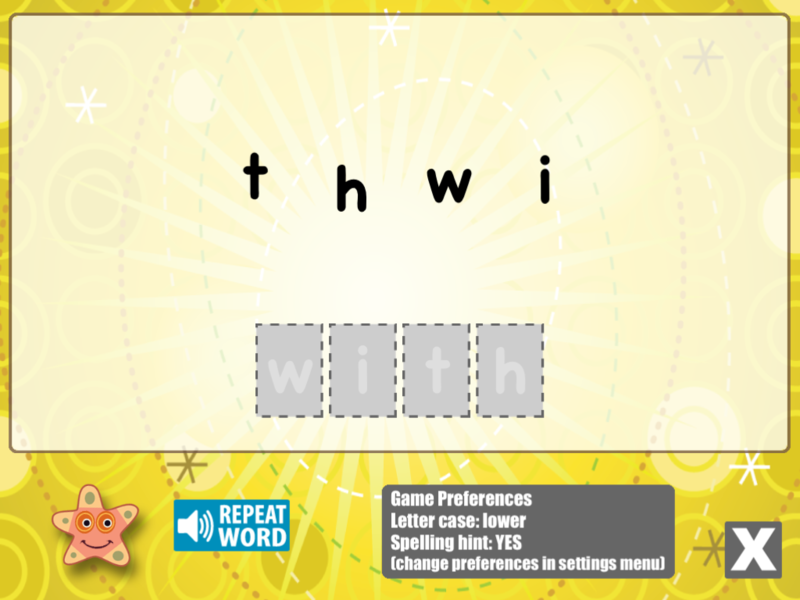 It has some additional games and a spelling practice component as well. Take a look! You can also find this game on our classroom WIKI page at the top of the screen. Just follow the links!